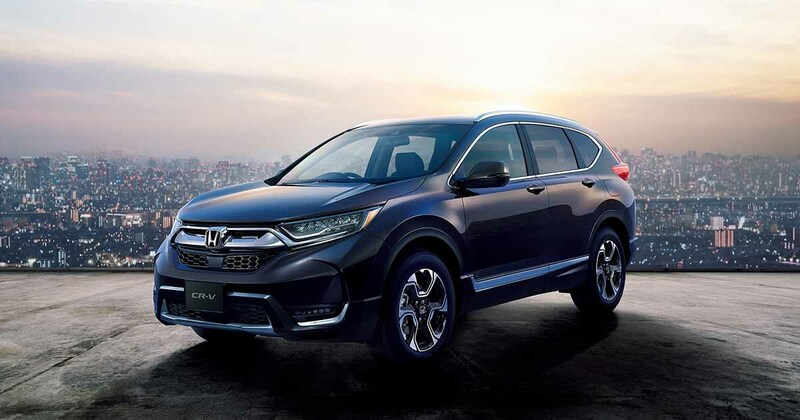 Honda CR-V is a 5-door brand new family-friendly SUV built for outdoor adventure and recreation drive journey. It provides a true sense of sportiness with a dynamic actionable driving performance for keen enthusiasts. It offers a front-wheel drive layout design structure with enhanced all-wheel-drive capability for rugged all-terrain off-road activities for customers. Exterior Design is made of sleek n stylish robust solid aerodynamic design comprised of glittering shine accessories to add more valuable appeal such as halogen projector beam headlights, daytime running lights – LED Lights, front metallic horizontal bar emblem grille, lower grille, front bumper, front under spoiler oval-shaped LED fog lights, electrically retractable door mirror with LED indicator lights, roof rails, and choices of 17 to 18-inches alloy wheels. On the backside, it provides a bold catchy display appeal added with shark fin rear radio antenna, L-Shaped taillights, rear fog lights, rear bumper, and dual exhaust tailpipe emissions. The captivating exterior body colours are brilliant sporty blue metallic, passion red pearlescent, midnight forest metallic, crystal black pearlescent, modern steel metallic, lunar silver metallic, and white orchid pearlescent. Interior Design offers a highly spacious and comfortable 5 to 7 passengers leather trimmed cloth seating accommodation. The seating provides an immense capacity of legroom space with ease of headrest for all ages of passengers. The front side fancy decorated dashboard adds a distinctive look and equipped with standard features such as electric parking brake with automatic parking hold, dual zone climate control, smart keyless entry with push start engine, advanced display radio, 7-inches color touch screen, 8-Speakers, AM/FM Radio, Bluetooth phone and audio connectivity, USB Connectivity, Apple Car Play, Android Auto, multi-angle reversing camera with dynamic guidelines, electronic brake-force distribution, emergency stop signal, hill start assist, vehicle stability assist, driver attention monitor, SRS Airbags, dual front, side and full-length curtain, full-size alloy spare wheels, tire pressure monitoring system, built in satellite navigation, front and rear parking sensors, lane watch camera, automatic dusk sensing headlights, and leather-wrapped steering wheel. Some of the additional features are the panoramic sunroof, heated front seats, 8-way adjustable electric driver seat with lumbar support and seat memory, automatic rain sensing wipers. Driving Safety Features are also added as Honda Sensing suite of driver assist technologies such as adaptive cruise control with low speed follow, forward collision warning, collision mitigation braking system, lane departure warning, road departure mitigation system, lane keeping assist, privacy glass, full LED headlights with active cornering lights, auto dimming rear view mirror, digital radio, leather-wrapped shift knob, blind spot information system, cross traffic monitor, and 4-way adjustable electric front passenger seat. Moreover, the rear side cargo compartment offers a vast extensive storage and loading with a power tailgate. It is a right-hand 2WD SUV offers a smooth flow of on-road drive journey and fitted with 1.5 litres of 4 cylinder gasoline 140 KW VTEC turbo engine powered by CVT Automatic Speed Transmission. The special price packages are VTI, VTI-S, VTI-LX, and VTI-L.